RPF Recruitment 2018 | Apply Online 9739 SI & Constable posts in RPF Vacancy 2018. Get RPF Notification 2018. Check Railway Protection Force Recruitment 2018 -indianrailways.gov.in Check RFP Jobs, RFP Bharti 2018, RPF SI Recruitment Notification, RPF Online Application Form here. Indian Railway Inviting Online Application forms from eligible candidates for Railway Protection Force Sub Inspectors (SI), Constable Posts. A Huge opportunity for all the aspirants who are waiting for RPF Recruitment 2018 Notification. The Railway Protection Force has now given light to RPF Recruitment 2018. Currently, there are about 9739 openings under RPF Vacancy 2018. You can also know more details about this at the RPF Official Website @ indianrailways.gov.in. The Railway Protection Force Recruitment 2018 Apply Online is open for all the interested candidates. Aspirants should apply Online for Railway RPF Notification 2018. Apply soon for Constable RPF Jobs 2018 and make this opportunity yours. Make use of this site to know RPF Constable Recruitment 2018. Constables: Applicants must be completed 10th class or its equivalent from any recognized institution or university with minimum qualifying marks. Sub Inspector (SI): Passed 12th Class from a recognized University or Institution. No Fee for Female, SC, ST, Ex-Servicemen Candidates. 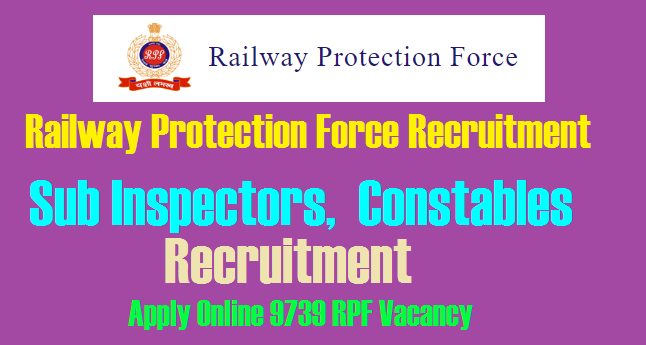 RPF Railway Protection Force Sub Inspectors (SI), Constables Recruitment Notification 9739 Vacancies Details, Apply online Important Links area available below.. The Railway Protection Force has now given 9739 openings under RPF Vacancy 2018. ONLINE applications are invited from eligible Male and Female candidates for the recruitment of Sub-Inspectors (SI) in Level 6 of 7th CPC Pay matrix for the vacancies in Railway Protection Force (RPF) of various Zones of Indian Railways and Railway Protection Special Force (RPSF). Applications complete in all respect should be submitted ONLINE ONLY before 23.59 hrs of 30/06/2018. You can also know more details about this at the RPF Official Website @ indianrailways.gov.in.